The war in northern Uganda may have moved to another region, but the wounds remain with some. Also while to some, the end of the war brought joy, to many also meant the begining of overcoming major challenges. Many were disfigured, missing body parts and limbs raped, have to live with scars screams of loved ones being massacre, psychosis and living with shrapnels in their body. Many say that whoever starts wars doesn’t understand that the horrors associated with it because they are really unspeakable, because they are things that victims simply cannot come back from. 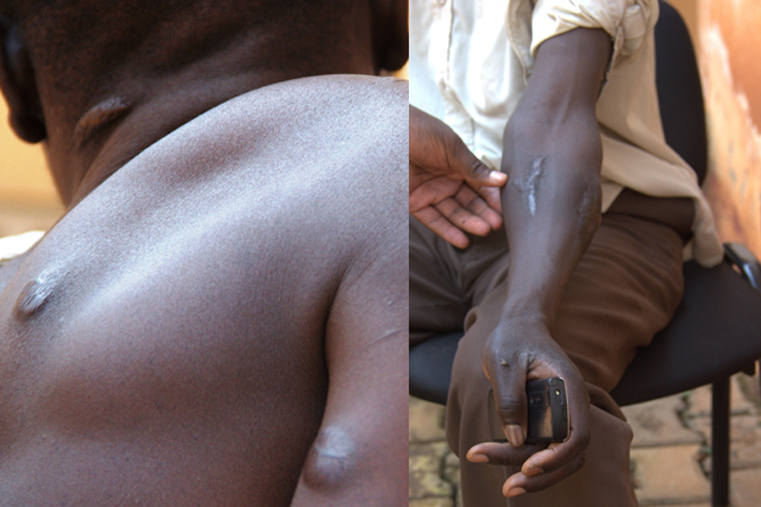 Mr. James Akera 39, a tailor in Laroo market in Gulu municipality says that he lives with the scars of war inside his body. Akera has lived with a bullet in his ankle for 18 years. Akera explains that at the height of the war, he was shot 7 times in different parts of his body, but only God knows why he did not die. He says that having been constitutionally failed by his government, he was abducted by the Lord’s Resistance Army (LRA) rebels in early 1993. “At the time, I was in Pader district, and we walked for days before finding out that we had reached into South Sudan,” Akera explains. “I was first shot in 1996 on the right leg, along the border between Uganda and Southern Sudan when the Ugandan People’s Defence Forces (UPDF) attacked us,” he added. “The government who should have protect us from abduction in the first place, was now hunting us down. “I survived that attack. I then sustained another gunshot wound in 1997 on the left leg, again in Southern Sudan. Then the third one came in 1998 when I was again shot by the UPDF on the other leg,” he added. “The fourth bullet, I sustained along the border with the Congo (DRC) in 2002, again the UPDF attacked us and I was shot in the neck this time, but I told myself I was not going to die this way,” Akera said. “Life was very difficult because my neck was injured and I could not move at all until we attacked a health centre where we got some medicines, but the local herbs were helping me,” Akera narrates. Then in 2003 Akera says that he sustained three bullet wounds in his right arm, neck and legs during another attack, which he again survived. He revealed that he has had 6 of the bullets which were lodged in his body removed from a Kampala Hospital but one is still left in his right ankle. “The doctors told me that I would become lame if they removed it, because there are no good doctors to do the operations in Uganda. They said that mine was complicated,” Akera explained. The doctors also told him that the bullet in his right ankle was lodged between the bones and that removing it would be a very complicated job which requires the work of a specialist. “They said that removing it would bring complications in my ankle and that without a specialist I would become lame,” Akera adds. Akera will have to stay with the bullet in his ankle for some time, unless he finds money to acquire operations from either Kenya or in India. He says that sometimes when he stands for a long time, the pain is unbearable. Akera also wants the government to apologise to all the children from northern Uganda who were abducted and some of whom have since returned from LRA captivity with bullets, because it faile to protect bthem. “Then they should resettle us property, taking into account our lost opportunities, by giving us help or designing projects that will benefit all of us,” he said. Akema says that he is very lucky to have four children and a wife who care deeply for him and his well-being. “Civilians suffered immensely in the entire northern Uganda at the hands of the LRA and the UPDF. They beat and mistreat civilians as a part of a campaign intended to instill terror in the population. They both severely punished anyone who did not do what they demanded, even if that person lacked the physical capacity to comply like children who were used like worthless things,” he said. According to observers, thousands of children remain unaccounted for in northern Uganda and tens of thousands have been affected by the brutal armed conflict – so many of them today live with an un unsettled future. Some of the children who have returned from captivity or have witnessed mass massacres in their villages have recurring nightmares and constant anxiety; others suffer from insomnia and low self-esteem, and find it hard to interact with their communities. But Akena says that every non-combatant in northern Uganda is a victim of the war and there was no need for the warring parties to subject innocent civilians to the level of depravity that transpired for over two decades. “This is the reality of war. The gravity of these experiences by the civilian populations depicts the urgency for the need to pay adequate attention to the impact of war on all victims in northern Uganda, particularly Acholi sub sub region; with specific focus on, overcoming scars, psychological effects, transforming the lives of women and children and reconstructing services that are desperately needed in the communities,” Akera concluded.